OK, so welcome to the club. According to the National Sleep Foundation, 76% of Americans experience symptoms of sleep disorders on a regular basis. Sleep is often an overlooked aspect of wellness and a good night’s sleep is a cornerstone of overall health; allowing the body to repair and regenerate. 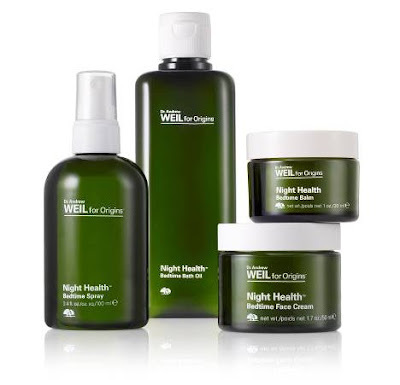 To help address the growing epidemic of sleep deprivation, Origins has once again teamed up with the world-renowned authority on integrative health, Dr. Andrew Weil, to develop Dr. Andrew Weil for Origin Night Health, an integrative regime of products that work with the bodies’ natural rhythms and functions to help promote relaxation and optimal health during the nighttime hours. This new line was introduced this month and includes Bedtime Bath Oil, Bedtime Face Cream, Bedtime Balm and Bedtime Spray. The aromas are heavenly and very relaxing. The essential oil blend used in the Night Health Collection includes Chamomile Oil, Organic Lavender Oil and Organic Mandarin Oil. These oils were specifically selected for their clinically proven qualities to help encourage relaxation.